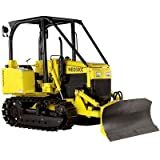 Features: * Model: Bulldozer/Crawler * Overall Length with Blade: 116.5in. * Overall Width (blade width, straight): 64.5in. * Overall Height to Top of ROPS: 84in. * Crawler Width (no blade): 55.5in.